Our friend from church Zach is eight years old and he often asks me questions about Fletcher. Zach wanted to come see Fletcher last winter. I had to tell him he'd have to wait until spring to visit because of RSV precautions. Well, on Tuesday afternoon Zach and his mom, Monica made a special visit. Unfortunately, Fletcher was a complete toot because we had just gotten back from therapy and he was tired! I so wanted Zach to be able to see Fletcher in his element and maybe play ball with him. Fletcher did finally warm up some but not to his full potential! Zach and his mom brought Fletcher a cool build a bear! It's so cute and cuddly! Thanks, Zach! He asked a few questions. He wanted to know how long Fletcher had been sick and how old he was. Zach's parents have done such a great job in raising a thoughtful boy! I'm so thankful Zach isn't afraid of Fletcher and wanted to know more about him. His mom was very supportive and let him talk for himself. That meant a lot to me. 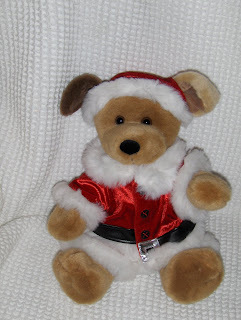 At Christmastime Zach and his family brought Fletcher his first build a bear which was a puppy in a Santa suit! 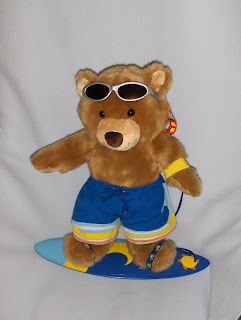 At church I thanked Zach for the bear and he said, "Well, when I heard Fletcher was going to be in a hospital at Christmas I thought he needed some toys." So sweet! Thanks again Zach you're a great kid! You never know, visiting Fletcher may have inspired this little boy to be a wonderful doctor some day!! Fletcher inspires me and I've never even met you all.